Asperger's Syndrome is a complicated condition that is often misunderstood and misdiagnosed. Parents and caregivers can often find themselves bewildered by the circumstances and accompanying behaviors that are associated with raising a child with Asperger's. 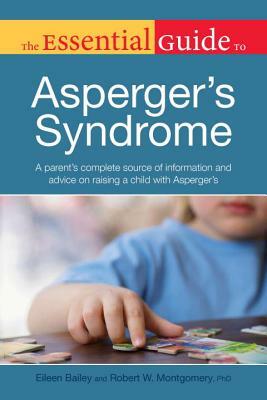 The Essential Guide to Asperger's Syndrome is a goldmine of practical advice for dealing with many of the common situations that often confront Aspies and their parents. Through the practical and immensely helpful tips in this book parents will learn how to turn potentially stressful situations into calm, manageable moments. Authoritative and complete, this book provides must-have information on seeking a proper diagnosis, different treatment options, developing social skills, dealing with bullying, finding the right school, and helping the young adult with AS transition to college or more independent living. Helping everyone in the family thrive and survive the challenges of Asperger's, this book will be a guiding light to any parent with an Aspie child. Eileen Bailey is a freelance writer specializing in writing about ADHD, anxiety, learning disabilities, and other health topics, and has been writing on education, health, and parenting topics for more than 15 years. She is the author of The Complete Idiot's Guide to Adult ADHD and was was previously the guide to ADD at About.com. More recently, she has written for a number of health and education sites, including sites focusing on learning disabilities in teens and young adults. She lives in Pottstown, Pennsylvania.Robert Montgomery, PhD, BCBA-D, is a clinical psychologist and also holds certifications in cognitive behavioral therapy and behavioral analysis. Since 1985, he has worked helping those with developmental disabilities and specializes in working with individuals, from young children through the geriatric population, with Asperger's syndrome and autism spectrum disorders. Dr. Montgomery has written numerous journal articles on topics relating to autism and Asperger's syndrome and routinely speaks regionally, statewide, and internationally at parent groups, advocacy groups, and conferences on different aspects of managing symptoms of Asperger's syndrome. He was recently asked to speak to initial responders in Georgia on developmental disabilities and was the keynote speaker at the annual conference of Commonwealth Autism.